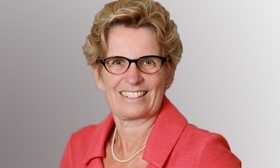 Ontario Premier Kathleen Wynne announced sweeping changes to electricity bills Mach 2. Automotive parts manufacturers in Ontario are getting another break on electricity rates. The province said March 2 it will expand the Industrial Conservation Initiative (ICI) program to include more manufacturers. It is reducing the qualifying threshold to an average hourly peak demand of 500 kW, down from 1mW, to open the program to hundreds more operations. The province had already decreased the average hourly peak demand to 1mW, down from 3mW, on Jan. 1, 2017. That change allowed about 1,000 more companies to qualify. Because Ontario uses time-of-use pricing for its electricity, meaning power is cheaper at night when usage is less than during the day, manufacturers only receive the larger ICI discount if they shift their production to a time of day when electricity use is not at its peak. The Automotive Parts Manufacturers Association previously said it’s difficult for many companies to shift production to a cheaper time of day, especially if they work two shifts or provide parts for just-in-time delivery. Even with the expansion of the ICI program, there will be some medium-sized or small manufacturers that don’t qualify for the incentive. However, those manufacturers that fail to qualify for the revamped ICI because their average peak demand for electricity isn’t greater than 500 kW will also get a break. They will qualify for a new 25 per cent reduction the province also announced, and will be exempt from paying the eight per cent provincial share of the HST. They’ll also see their bill reduced by an additional 17 per cent. “Any movement that allows people to make decisions on when they might use energy, whether it’s specifically helpful to your operation or not, the government has understood that it’s a material issue,” Volpe said. To achieve the 17 per cent decrease, the province is lifting billions of dollars in costs off customers this year, and moving those costs onto future hydro bills. The two rate changes that affect manufacturing were part of a larger, sweeping overhaul the governing Ontario Liberals announced to lessen electricity costs to all Ontarians. The Liberal plan is to keep electricity rates at or below the rate of inflation over the next four years.